Imagine sitting at your breakfast table gazing out across this view. 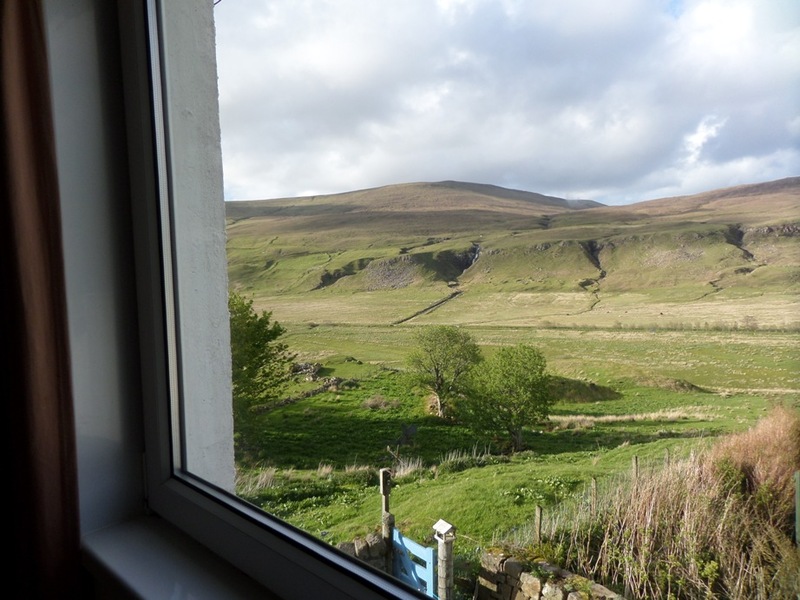 This affordable accommodation is a cosy first floor, self catering flat, with spectacular views across the glen, to a number of waterfalls. It is situated in a beautiful and remote area, above Uig bay in a renowned area called The Fairy Glen. Please note that we are at the end of a very busy 2 mile single track road, due to the number of visitors to the Fairy Glen. Uig is on the Trotternish Peninsula of North Skye and is ideally located for touring the island, catching the ferry from Uig to the Outer Hebrides or as a great base for hill walking and climbing. All heating, electric and hot water. Freeview TV with HDMI connection (cable not supplied). Free WiFi but low download speed. Exclusive off road parking space. Baby highchair available on request. General store, Post Office and petrol station, takeaways, restaurants, 2 bars, brewery, pottery, 3 churches, boat trips, fishing trips, cycle hire, ferry terminal to the Outer Isles, local and mainland bus services.